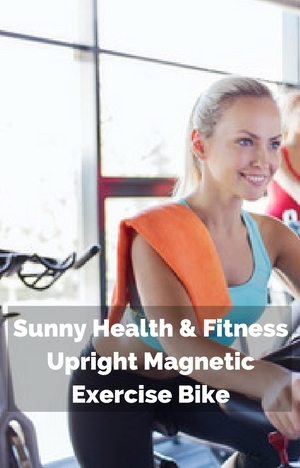 The Sunny Health & Fitness Upright Magnetic Exercise Bike is an affordable priced bike. As you’d expect from that it is a basic bike. There aren’t any bells and whistles. It comes with console for measuring workouts and hand pulse sensors. If you just want to get on the bike and get on with your workout then you don’t need a lot of add-ons. You might even think they are annoying. And why pay for something you won’t use! In this review I look at just how well it meets the needs of those who want a bike they can just get on with their exercise. If you’re like me, when you get a bargain you also expect it to work without too many problems and get good use out of it to. It’s important it provides a low impact workout at the level you want and it’s quiet so you don’t disturb others and you too. The bike provides a reasonably stable platform for workouts in the seat despite its’ size and being lightweight for an upright bike. It has a steel tube frame and crossbars to keep wobbling to a minimum. You can just get on with your exercise without concerns of tipping off or being annoyed by any creaks and groans. However, it’s not really made for standing on the pedals. It will rock slightly if the floor is uneven and the best solution is probably to put it on a rubber mat to stop this from happening. It seems that after about 3 years or so the belt starts to loosen and you may find the intensity not as great as when you first got the bike. For one person it was still usable where as another it wasn’t. It seems you can count on at least 3 years from the bike with some getting more, reporting it still is going strong. It also seems the later models are doing better than the earlier ones. The seat can be adjusted up and down to provide a good fit for people between the heights of 4 ft 10 ins and 5 ft 11 ins based on customer feedback. Making the adjustments is easy to do and quick – so it won’t really get in the way of your exercising or be seen as too much of a hassle. It only needs to be done if someone has changed it since you set the bike for you. It allows it to be used by multiple people – it takes seconds. There is an adjustment knob you loosen , slide the seat to the height you want, insert the knob and pin into the pre-set hole and tighten back up. If you are going to be sharing the bike with someone who needs a different set up. If you are above 5ft 11 ins you won’t get the proper extension of the knee and probably feel like you are cramped up. Whereas below 4ft 10 ins you probably have to stretch to reach the pedals at farthest point from the seat – which will make it uncomfortable to say the least. It does depend on your leg length and if you have longer legs you may find it works for you. The 8 levels of magnetic resistance are controlled by the tension knob on the front support just below the handlebars. You twist it to the right to increase the resistance and to the left to decrease it. The levels are marked on the knob itself. Reaching and making the adjustments is easy. The movement between the levels is smooth and there are no sudden increases or decreases in resistance. It goes from very easy (almost like there is none) to moderately hard. For many these levels will give them the workout they are after. It can help with strengthening legs as well as get the heart rate up and get you sweating. The upper levels of resistance won’t satisfy those that are very fit and want challenging workouts – they’ll find it a bit too soft for that. Most others will probably find the resistance between 3 and 6 is enough to get a good low impact workout. There are no requirements for maintenance and it doesn’t make a noise apart from the tension knob clicking as you turn it to a new resistance level. Within the shroud at the front of the bike are the belt drive and flywheel. These operate quietly and are low maintenance. They work with resistance to provide a reasonable and smooth pedaling motion. Although at the higher levels of resistance you may notice it starting to pulse due to the resistance working as a brake slowing down the pedals at the top/bottom of the stroke. This is usual for bikes in this price range. The shroud helps to protect the flywheel and drive from dust and dirt as well as keeping out of the reach or pets and kids and ankles that might otherwise be injured. The pedals have a plastic strap to help with positioning your foot and to prevent them slipping off. They work best with athletic shoes or similar. It can be a little tough at first adjusting the strap but it does get easier as the plastic softens. If there is just one of you using the bike there is no need to adjust the strap as you can just slide your feet into them. The bike isn’t really designed for standing on the pedals like a spin bike or indoor cycle. It is more for sitting and pedaling – there isn’t the room, the resistance probably will feel too easy and it has a 1 piece crank – which is going to durable enough for sitting but standing for extended periods will probably reduce the bike’s life. Sunny Health & Fitness have a belt drive indoor cycle (which quieter than a standard chain drive) that is better for this type of workout – you can read about it here: Sunny Health & Fitness Belt Drive Indoor Cycle. It doesn’t have magnetic resistance and it does cost over $200. You can pedal backwards on the bike but there isn’t any resistance and you need to check the pedals haven’t become loose from it. Seat. The seat is wide and is felt to be hard by many (but not all). This is a common problem with exercise bikes in general and in particular with a number of Sunny’s bikes. To solve this issue people have bought a cruiser size gel seat cover and that appears to be enough to add the comfort needed. The seat doesn’t have the standard bike fitting which makes it a little harder to replace if you “hate it. ” But it can be done. If you want to do it yourself you can with a universal exercise bike seat which attaches to the triangular fitting and converts it to a standard bike fitting. You can then fit any standard bike seat to the bike. Or you can take it to a bike shop and they can sort it for you. Handlebars. The handlebars are fixed in place. If you are below 5 ft 3 ins you may find that you have to lean forward a little more than you want but it is not too bad and shouldn’t stop you being able to use the bike for your workouts. They are covered to provide a more comfortable and secure grip. Noise. The bike operates quietly. It won’t disturb others while your pedal away and you won’t need to turn up the TV to hear it. The loudest noise is likely to be heavy breathing and the resistance knob does click a little when you change the resistance. If you live in an apartment your neighbors probably won’t even know you are exercising and if you want to make doubly sure a rubber exercise mat will absorb any vibrations so nothing will transmit to a lower apartment. Cleaning Up. It doesn’t generate much in dirt and dust. The biggest source of cleaning is to keep it free of sweat. It is very corrosive, so wiping the bike down will stop it rusting and jamming up. It only take a few moments to do. Also you may want to protect the floor from sweat which you can do by putting the bike on a rubber exercise mat. The bike is fairly compact needing an area of 23 by 34.5 ins when not in use. It should easily fit in a corner or under the stairs out of the way. It looks okay and its size does mean it won’t be too tough to leave it out (it won’t get in the way and isn’t an eyesore – so it is there waiting for you and/or others to get on and exercise with it calling out gently to you! To move the bike you can tip it on to its front crossbar support. The end caps work as wheels allowing one person to easily move it where you want to go. It will stick on some carpets and soft surfaces. So you may end up having to slide it on those. If you need to carry the bike, it weighs about 42 lbs – it will be easier with two of you. If you want to move it over a wood floor I’d be careful to make sure it doesn’t leave a long scratch across it. The bike is delivered part assembled. It normally takes between 1 to 2 hours to finish the assembly. It is fairly easy to do. Everything you need to do this is included – instructions and tools. The instructions and diagrams are good enough to follow. The hardware is already sorted so there is having to find and guess which part goes where. The hardest part of the assembly has been completed before it is delivered. You are required to add the pedals, front support, seat post, seat, handlebars and console to the bike. There is one part that some real care needs to taken over to get it right. This is attaching the tension cable- if you look at the instruction and the diagram you shouldn’t have a problem with this – it’s important as this controls the resistance levels – if it’s not done right there won’t be any resistance. It can be done by one person but having someone to hold the pieces while you bolt them on saves the feeling of not having enough hands and makes it easier. If you don’t want to attempt it yourself you can get the bike assembled in your home using Amazon services. It does cost extra and you need to arrange a time for the person to come and assemble it. The service seems to be well regarded by customers and does do away with the worry. The bike comes with a basic console. It displays time, speed, calories, distance, odometer (cumulative distance) and heart rate when hand pulse sensors are gripped. You can set it so you can manually move through the measures while you exercise or you can set it to scan so that it rotates through the numbers. The screen is large enough so that you can see the measure displayed easily from the seat. The console is battery operated (penlight batteries), so it doesn’t restrict where you can put the bike. Also, you can use the bike if the batteries are drained – the resistance still works you just won’t get any feedback on your performance. The display screen isn’t backlit so in poor light conditions it can be difficult to read. If you like to track and record your workouts you will need to do this manually as there is no facility for uploading results to a fitness account. For some people the hand pulse sensors can provide a reliable reading of their heart rate. But for many they find it isn’t accurate or they can’t get a reliable signal. This isn’t just on this bike but on all bikes with this type of sensor. If you want to monitor your heart rate and can’t get a good reading from this, then doing it separately with a heart rate strap maybe a better option for you. It doesn’t come with any accessories not even somewhere to put a water bottle. If you want this or a media device or TV remote close to you, you’ll have to hold on to them or exercise near a table or buy a holder separately. The manual provides some tips on warm up stretches but doesn’t include workouts you can try to get you started nor does it provide details on where you should set the seat to for the most effective workout. Fortunately there is plenty of information online you can use to get you started. The bike has reasonable ratings from customers with 72% scoring it a 4 or 5. Earlier on there seemed to be issues with the belt coming off the flywheel or shredding in the first few weeks of use. But it does seem not to be a problem now, as it isn’t mentioned in later reviews. Otherwise there are some who have had issues where the company has not responded quickly enough. The seat comes in for a lot of criticism in the reviews with it being hard, which reduced the overall rating – many do cover it and that helps out. Also, if you are about 5ft tall it takes a little getting used with leaning forward to use the handlebars. Aside from that customers find it quiet, compact and easy to use. It is easy on their joints and once the seat is sorted they can use it for as long as they want for their cardio workouts. They think they got a good deal and they do use it. The bike’s price is around about the same as other similar bikes with a basic console and hand pulse sensors. It provides good value for those looking for a bike for a beginner or those looking for moderate cardio exercise. When I checked at Amazon it can qualify for Prime and free shipping on qualifying orders. The Sunny Health & Fitness Upright Exercise Bike is a a good starter bike and one for those looking for moderate levels of exercise. It’s not built for tough workouts by those who are very fit. It’s more for getting in shape and staying that way. It’s great for burning calories. It is reasonably well made for the price but don’t expect it to last forever, with it lasting about 3 years or so for customers with regular use. It can be very tough on the sit bones and even after spending time to wear it in you may need to buy a gel seat cover. Also if you are 5ft 3 ins and under you will probably find you have to reach forward to use the handlebars. It is a good basic upright exercise bike for moderate workouts. It is quiet and gentle on the knees. It’s small so it can fit in most homes.